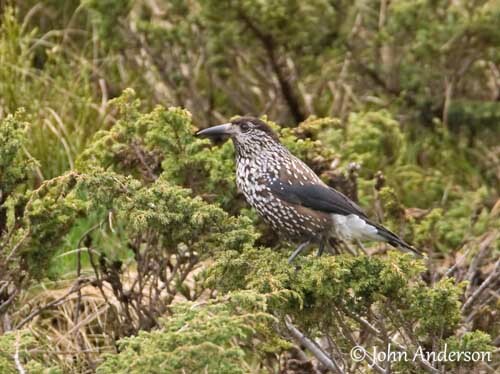 The Spotted Nutcracker is closely related to mountain coniferous forests. Its name comes from its highly specialized bill allowing the bird to crack nuts open. The adult of nominate race (here described and displayed) has dark brown plumage heavily streaked and spotted with white on most of the body. Crown and nape are much darker brown. Head sides are more densely streaked white, making the cheeks almost white. The white spots are larger and more spaced on scapulars, breast and flanks where they form confluent lines. Rump and uppertail-coverts are dark brown whereas lower belly and undertail-coverts are white. On the upperwing, the feathers are glossy black. The coverts show a small white spot at tip. The tail is glossy black too, with white-tipped rectrices. These white tips are narrow on central rectrices and become wider towards the outermost tail feathers. Such pattern appears almost white seen from below. The bill is black, strong and fairly long, straight and pointed. The inside of the lower mandible shows peculiar morphological criterion, with a ridge on the inner side of this mandible. This physical feature allows the bird to crack hard seeds open. The eyes are dark brown. Legs and feet are black. The juvenile resembles adult, but it has duller wings and tail, and median coverts are broadly white-tipped. Streaks and spots are buffy-white. There are 8 subspecies separated in two groups. The first group, with races from W and N range, are heavily spotted and differ from each other in bill shape. The races from S range have slightly longer tail and lack the white tips of central pair of rectrices. They have much browner plumage with less extensive white spotting. The Spotted Nutcracker’s common call is a harsh, dry “krraaaaaak” usually far-carrying and given from treetop. This call is sometimes quickly repeated in a discordant rattle. It also utters a short “zhreee”. The song is a series of quiet musical piping, squeaking, clicking and whistling notes, interspersed with mimicry. However, this song is only audible at close quarters. 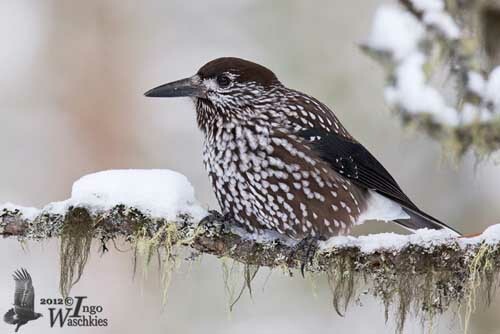 The Spotted Nutcracker frequents open coniferous and mixed forests where conifers predominate. It is mainly found in mountain forests with clearings and alpine meadows in Continental Europe. In the Himalayas, this species is found in mixed rhododendron and conifer forests. But when periodic irruptions from Siberia occur, they can be found in various types of habitats, from urban parks and gardens, to small offshore islands and desert oases. The Spotted Nutcracker has wide range from W to E, from Scandinavia throughout N Europe, Siberia, and to E Asia, Japan, N and S Korea, Taiwan, W, NC and N China, N and NE Indian Subcontinent, S and SE Tibet. It is an uncommon resident in N Myanmar. The breeding season starts even when the snow is still covering the ground, thanks to the cached seeds providing them food. The Spotted Nutcracker is monogamous and a strong pair-bond is sustained all year round between mates. The territory is defended by the pair. They are solitary breeders. The black and white tail pattern is displayed by fanning the tail after landing and during courtship. There are usually less courtship displays in pairs with long pair-bonds than in new pairs. The Spotted Nutcracker is basically resident in its range, only moving short-distances for hazelnuts. During the hard winters, some populations living in higher cold regions descend to lowlands. They disperse widely in search of food. Irruptions may occur sometimes, with large flocks coming from cold regions and reaching unusual areas. 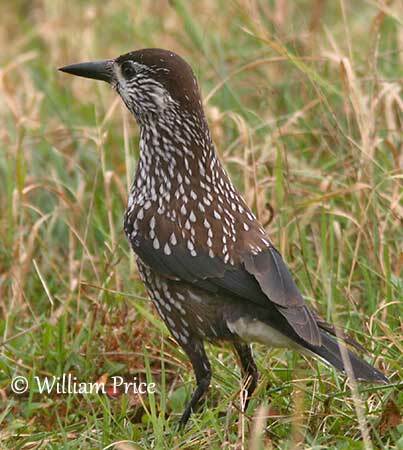 The Spotted Nutcracker has less jerky flight than other Corvidae such as jays. It may hover to get at hazelnuts. It performs direct flight often high in the air, with fluttering and slightly hesitant wingbeats. The breeding season starts in late winter with the egg-laying throughout March, and even sooner, with a peak between late February and mid-April. They are solitary nesters. Both adults build the typical Corvidae nest, a cup made with twigs and branches woven with lichens and shoots of bramble. The deep cup is lined with willow seeds, mosses and lichens. The nest is placed close to the trunk of a conifer, at about six metres above the ground. The female lays 2-5 bluish-white eggs with dark markings. Both adults incubate during 16-18 days, but mainly the female. The chicks are fed by parents and leave the nest 23 days after hatching. They remain in family group during three months after fledging. The family breaks up in early July. The juveniles establish their own territory and forage to hoard nuts to help them for spending the winter. 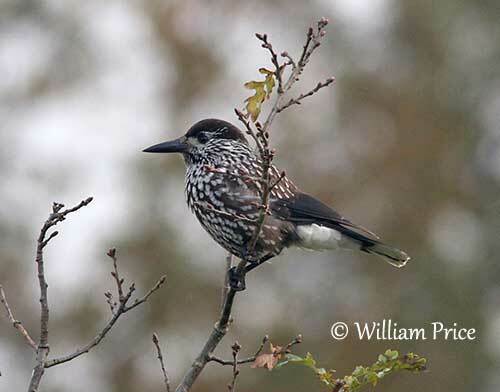 The Spotted Nutcracker feeds on pine nuts (Siberian Pine), seeds of several conifer species and hazelnuts. A wide range of invertebrates is taken in spring and summer, such as insects, spiders and earthworms. It may sometimes hunt for small rodents and small birds. 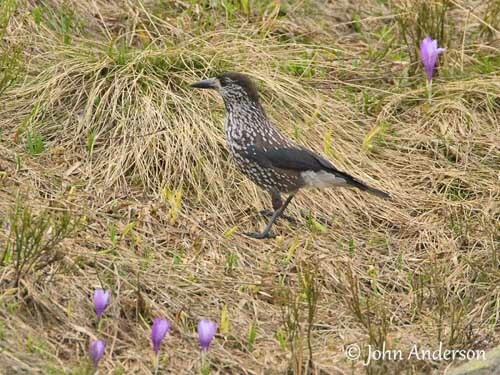 The Spotted Nutcracker is locally common. Numbers may vary according to food resources. Populations of most European countries appear to be increasing, due to extensive conifer plantations in last decades. The Spotted Nutcracker’s main food is pine nuts, and mainly those of the Siberian Pine. But it takes seeds from several conifer species and other nuts, especially those of hazel. In spring and early summer, it feeds on numerous invertebrates such as insects and spiders. It may catch small rodents and small birds too. It is able to crack nuts open, thanks to its specialized bill, but it also holds cones and nuts under the foot and hammers at them with its strong bill. It stores large quantities of food in its winter territory, in caches at base of trees, bark crevices, behind rocks or buries them into the ground, under the leaf-litter. The Spotted Nutcracker has special sublingual pouch behind the tongue in which the food is carried to the caches. It also plays a role in dispersal of seeds. It hunts sometimes from perch and drops abruptly to the ground. It clings to tree trunks and digs into bark crevices. It may hover at hazelnuts. Very opportunistic during irruptions, it takes all kind of household scraps. It forages in vegetation, among foliage in conifers, and on the ground at base of trees. On the ground, it hops, walks and bounds. This species often occurs in pairs of in family groups.